Rough Service Bulb 75W 120/130 Volt BOWES RS75. While they can be used for normal household or business usage, they are at their best when used in rough handling applications - such as trouble lights, machine tools, etc. These bulbs are designed to hold up where regular bulbs would not survive. 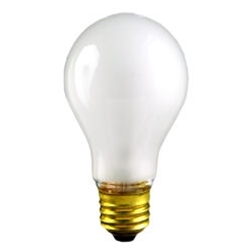 Rugged filaments and mounts inside the bulb resist rough handling and shock.